I have a new challenge/question for you! I am doing more of the meditations and chants now. I think that if I did it more regularly it might help me put up with tinnitus. Is there any evidence that meditation and chanting is useful for this complaint? Kind regards from the UK! Thank you for a great question Tessa. Tinnitus is a condition characterised by noise in the ears (often described as buzzing, whistling, humming or ringing) which has no obvious cause. There are a number of research projects and studies that are combining meditation and chanting to measure its effects on tinnitus. Research has shown that the more you try to fight your tinnitus the more your brain actually tunes into it. Based on scans that show when the brain tries to shut out the relentless humming, there is actually increased brain wave activity. So, instead of emptying your mind, you are asked to observe what is present, including your tinnitus, and anxieties about it. Bringing acceptance to the sounds teaches the brain that there is nothing threatening about them. The Royal National Throat Nose and Ear Hospital in London, England offers 8 week mindfulness based cognitive therapy groups for people with tinnitus. Most participants show a clinically significant improvement in measures of tinnitus distress and emotional well-being. In fact, there was a research study at the University of California in San Francisco that tested the effectiveness of Mindfulness Based Stress Reduction programs for patients with tinnitus. 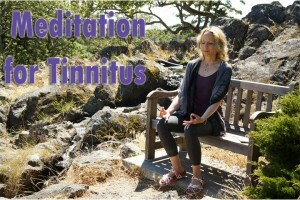 Again, the meditation practices give tinnitus sufferers the tools to acknowledge the tinnitus and live with it and many have reported overcoming the anxiety and depression they previously associated with it. So yes, the research is showing a lot of positive results for tinnitus and meditation. If you are interested more in meditation I would encourage you to check out our Eight Limbs of Yoga Series which leads you into meditation. Additionally we have a lively meditation group on our membership site. We would love to have you join us there. For more information about our membership site, click here.